One of the most challenging things about being on the move with a baby, as any mummy will testify, is the amount of stuff you end up carting around with you. The list seems never ending, and leaving the house in the morning can seem like a military operation. Then you realise that you don't use half the stuff you brought out with you anyway! Being a confirmed collector of handbags, it's also a sad fact of motherhood that I never get to use them any more as everything gets chucked into Theo's changing bag. 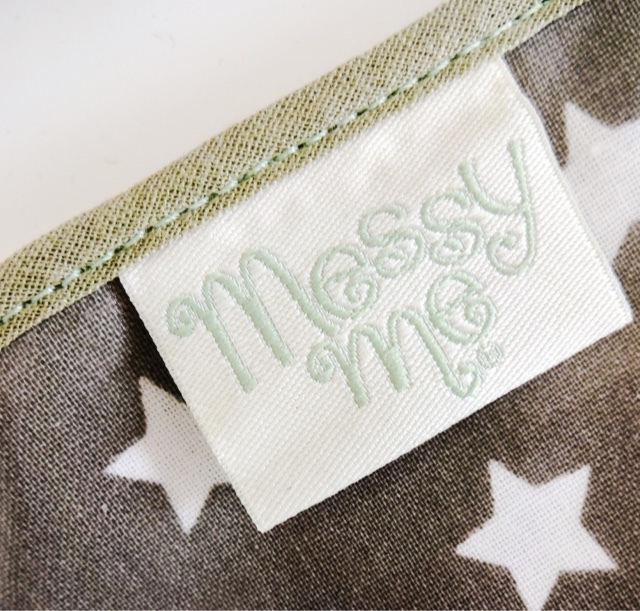 That's why I love the idea of this Changing Clutch from British baby accessories label Messy Me. If you're looking for a small nappy bag it's ideal. It's a great way to travel a bit lighter. Designed to hold a couple of nappies, some wipes, a nappy bag or two and a tube of lotion, it's the on the go answer to your usual bulky changing bag. This is perfect for those occasions where you know you're just quickly nipping out and don't need the full kit with you. Theo and I go to a lot of local coffee mornings, baby groups and quick trips to the shops where this has been the ideal solution. 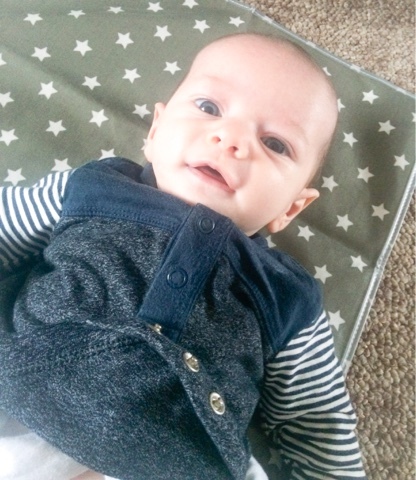 There's a clutch pouch and a fold out changing mat in a wipe-clean oilskin material. I really liked this, because not not is it stylish, but it also fends off any messy disasters. The folding travel changing mat that came with my bag is good, but for some reason it's made of this absorbent nylon material. The first time Theo did a messy poo (it happens!) the mat was stained and the mark doesn't wash off. With the Messy Me mat this isn't a problem. It can be wiped clean easily or even popped in the washing machine on a low setting. 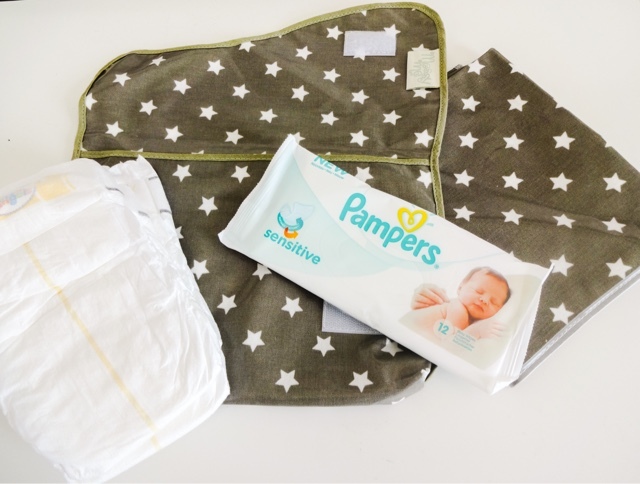 It's very thin and lightweight, which is brilliant for portability and it gives you something to pop over those fold down changing tables you get. The only thing that would improve it is a little bit of padding for the changing mat. This would make it slightly bigger but it wouldn't have to add too much bulk and would make for a bit more baby comfort. There are five designs available, a pretty floral and this white star print in several colours, including this chic olive grey shade. 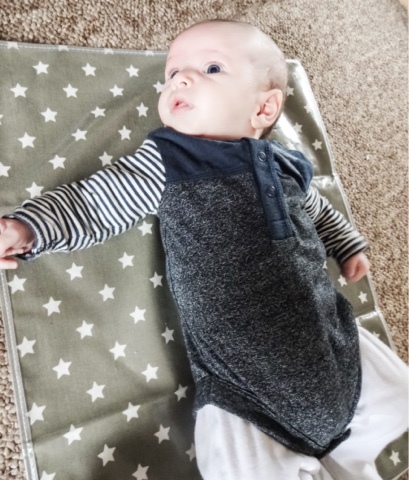 The clutch opens with a Velcro fastener which is nice and easy to open one-handed (a must when you're juggling baby and changing table and God knows what else!). 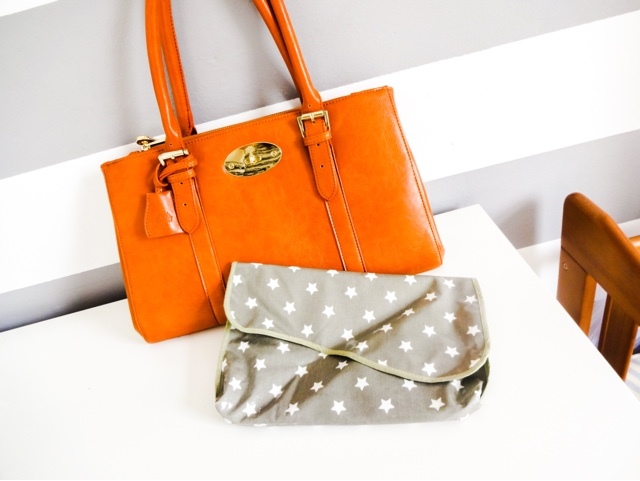 Out of all the nappy changing bags I've come across, the clutch changing bag is a genius idea and it even allows me to use one of my usual handbags when we go out- because sometimes a changing bag can really ruin an on point look! Instead of chucking my stuff into Theo's bag, I can put his stuff in mine! I've been keeping it in his large changing bag so it can come with me, or I can grab it and pop it into my handbag if we're just nipping out quickly. It's a great secondary bag to treat yourself to if you want a slimline solution to taking the baby out, or it would make a lovely gift for a mother to be, because it's super useful and super cute as well! 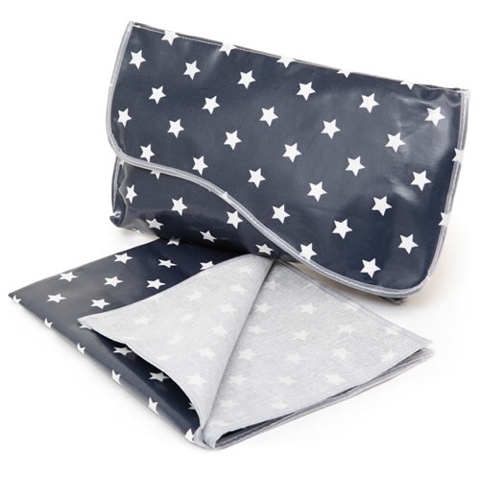 As well as the changing clutch, Messy Me have a range of high chair covers, bibs, and play mats- all in those beautiful wipe clean oilcloth fabrics. 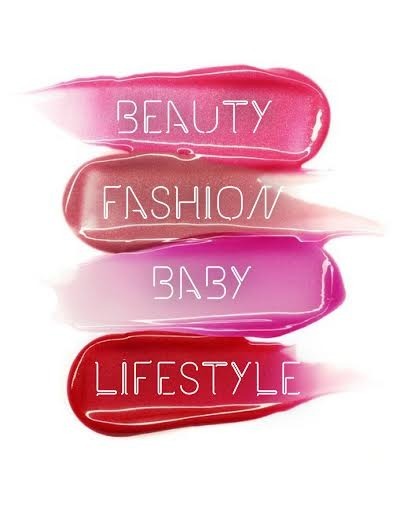 They're a family run business that makes all their products in the UK and are pulling down rafts of awards for their innovative and stylish range of baby accessories. I can see why! The changing clutch its £18.50 so it's a great price to give as a gift. 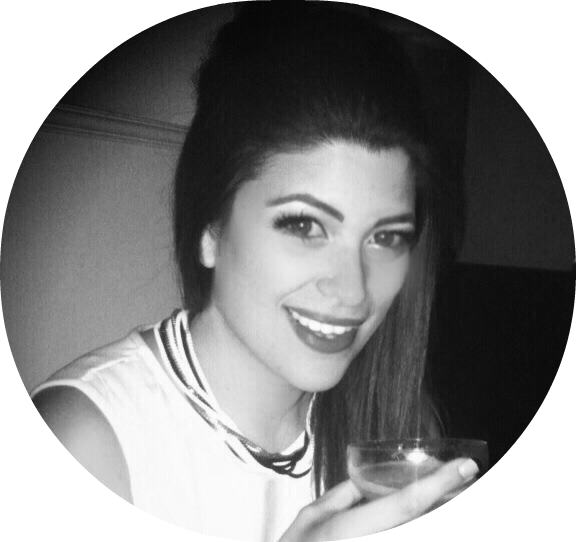 It's available on the Messy Me website and you can also check their Twitter and Facebook for up to the minute news.